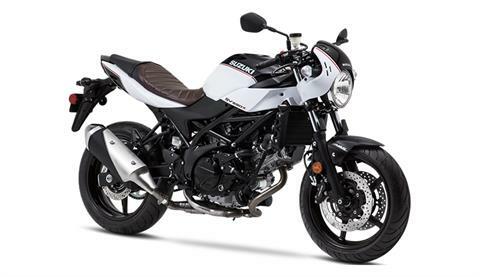 If you’re looking to get out on the road on a sporty bike with café racer styling, look no further than Suzuki’s SV650X. The SV650X is a brash, middleweight bike propelled by a smooth-revving V-twin engine tucked into a slim and lightweight trellis frame. And there’s more, as the SV650X combines power and agility with classic café racer looks. Whether in stop-and-go city traffic or on country roads, this bike delivers exhilaration and riding fun. No matter where you pull up to park, the retro appeal of the SV650X is unmistakable with its bikini fairing above the headlight, corresponding clip-on handlebars, a tuck-and-roll-look seat, and blacked out controls. Mix in your favorite stretch of road and you’ll see that this café bike’s smooth V-twin power and agile handling make the SV650X an exciting ride with unmatched curb appeal. Attention to rider comfort and confidence includes a carefully shaped seat with a high-grip, tuck-and-roll-looking cover in leather-texture brown vinyl. Integrated cargo retention loops pull out from under the seat. The café racer styling was developed to create a classic, bike-builder look that also showcases the V-twin engine. 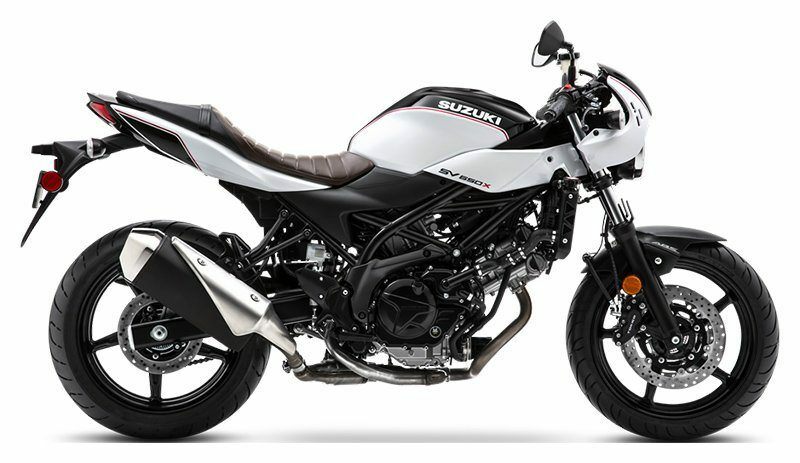 The ready-to-ride weight of the 2019 SV650X is a low 437 pounds. The SV650X fuel tank is short and narrow but maintains the same 3.8-gallon (14.5-liter) fuel capacity in both US and California versions. The 41mm conventional-style front fork has a generous 125mm (4.9 inches) of wheel travel to provide a sporty but plush ride. Preload adjusters in the fork caps allow the rider to tune the fork springs for different loads or riding style. The front brakes feature a pair of fully floating 290mm discs are grasped by four-piston Tokiko calipers for excellent braking performance. The compact Anti-Lock Braking System (ABS)* ensures braking power matches available traction. Dunlop Road Smart III tires are fitted to the SV650X to help with handling and all-around tire performance. The instrument panel has several features, including a tachometer, speedometer, odometer, dual trip meter, reserve trip meter, clock, coolant temperature/oil pressure indicator, ABS alert, and gear position, plus fuel consumption and driving range data. The clip-on handlebars and mid-set foot controls create a riding position that’s ideal for sport riding yet retains enough comfort for longer rides. The classically round headlight is multi-reflector type with 12V60/55-watt halogen bulb. Suzuki’s innovative L-shaped piston rings contribute to reduced blow-by gas, resulting in less emissions and greater combustion efficiency. The TI-ISC on the SV650X incorporates Suzuki’s Low RPM Assist feature that seamlessly adjusts engine speed during takeoff and low-speed running to smooth the power delivery and to help eliminate the possibility of the rider stalling the motorcycle. The SV650X also features Suzuki’s Easy Start System that lets the rider start the motorcycle with a momentary press of the start switch without pulling in the clutch lever when the transmission is in neutral. The exhaust muffler and its brushed stainless steel cover are located to permit greater lean angles when cornering. The stylish headlight cowling creates a café fairing look as the clip-on handlebars and trim, tuck-and-roll-look seat produce a sporty riding posture that is ideal at any speed. Side panels below the fuel tank mimic a half-fairing look and connect the body styling from nose to tail. The brown, leather-like finish of the seat adds a custom, bike-builder touch to the motorcycle. The SV650X’s two-tone, Glass Sparkle Black/Pearl Glacier White bodywork is complemented by blacked out wheels, controls, and chassis components. Visually stunning, the trellis-style frame is fashioned using high-strength steel tubes so it contributes to the motorcycle’s low weight and trim chassis. Dual four-piston Tokico brake calipers up front grasp a pair of 290mm fully floating stainless steel rotors for great stopping performance. The compact Anti-lock Brake System (ABS)** matches the braking performance to the available traction.